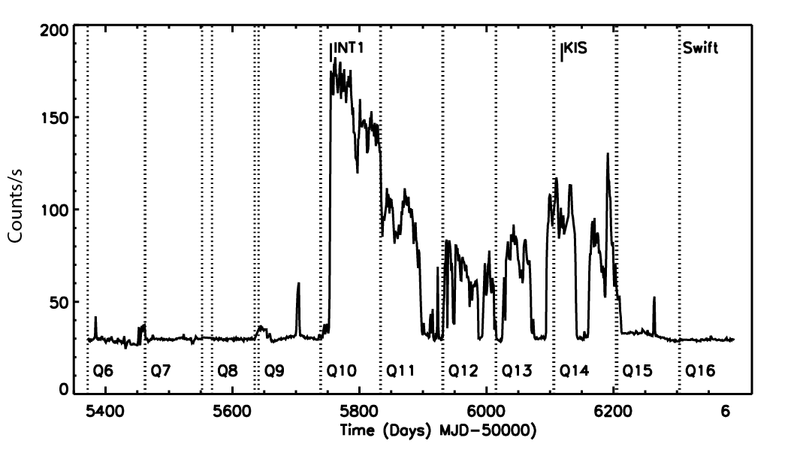 Title: BOKS 45906: a CV with an orbital period of 56.6 min in the Kepler field? Figure 1: Artist’s conception of a CV, with material escaping the main sequence donor star to form an accretion disk that can deposit material onto the white dwarf primary. Credit: NASA. A cataclysmic variable (CV) is a binary star system where the primary is a stellar remnant known as a white dwarf, and the secondary is usually a main sequence star. The secondary is also called the donor star because it’s overflowing its Roche lobe and losing mass to its primary companion. This escaped mass forms an accretion disk around the white dwarf (see Figure 1), which falls onto the white dwarf over time. An unstable rate of infall causes enough hydrogen to get dumped onto the primary to ignite a fusion reaction, which causes the CV to spike in brightness at unpredictable intervals. BOKS 45906 was identified as having colors consistent with other CVs in a pre-launch survey of the Kepler spacecraft’s field of view, and was also seen to go through an outburst period, increasing in brightness by a factor of ~25 for five days. Ramsay et al. were looking to study CVs in the Kepler field, so they included it as one of their targets for further monitoring during the Kepler mission. In the end, they were able to use three years of Kepler data, as well as observations from the Isaac Newton Telescope, Swift, and the Hale 200″ Telescope, to learn more. The Kepler data show the target in both quiescent and bright states (see Figure 2), with its flux varying by a factor of ~6. 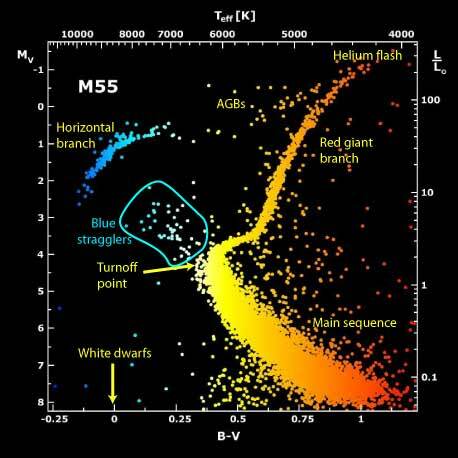 The additional observations examined the target in the UV and X-ray, since CVs are known to emit in those wavelength ranges, and used optical spectroscopy to find out the kind of material being accreted. Figure 2. Light curve showing 11 quarters of Kepler data. Varying levels of activity are clearly visible, with the first year being very quiet compared to the middle 5 quarters of data. The fact that BOKS 45906 was seen as a UV and X-ray source, combined with its variant flux, confirms that it is an accreting source. Kepler’s job is to hunt for transits, and CVs are by definition binary systems with short periods, meaning there is a high probability for them to be eclipsing binaries. The wild variations seen in Figure 2 are not periodic, but the orbital period of the system should be stable over the three year time frame of the observations, so the authors examine the quiescent states of the data to look for a stable period. They find a signal in the data suggesting the two stars orbit each other every 56.56 minutes. The same period is seen during bright states, but at a much lower significance. Over time, the orbital period of any CV will decrease, as the pair loses angular momentum. However, at some point, the donor star loses so much mass that it stops burning hydrogen. Models predict that the change this causes in the donor’s radius causes the period to “bounce” and start to increase again. This “bounce” should happen when the period decreases to ~70 minutes, so what is going on with BOKS 45906? As it happens, some classes of CVs, known as AM CVn (where the CV doesn’t even stand for cataclysmic variable, but rather AM Canum Venaticorum, the first example found in this class), can have periods as short as 5 minutes—these are a special class of CVs where both stars are white dwarfs. But there are no hydrogen lines in the spectrum of AM CVns, and Balmer lines are clearly detected in the spectrum of BOKS 45906. It probably instead belongs to an even more elite class of helium rich accreting binaries. While helium lines are not detected in the spectrum for BOKS 45906, a system like it with a similarly short period shows only weak helium lines, and their presence in BOKS 45906 cannot be ruled out at the current signal-to-noise. Only 3 hydrogen-accreting CVs with periods under 76 minutes have been found to date, with another 3 listed as candidates. If the period is indeed as short as the Kepler data suggest, BOKS 45906 is set to join a very select club, and teach us a lot about the evolution of binary systems.